[Vila-Matas] charges the various tensions in his hybridized book: the artificial nature of plot and the apparent triviality of day-to-day existence, how life imitates art and art imitates life… Mac’s Problem boasts an impressive architecture. Mac is currently unemployed and lives on his wife’s earnings from her furniture restoration business. An avid reader, he decides at the age of sixty to keep a diary. Mac’s wife, Carmen, a dyslexic born of dyslexic parents, thinks he is simply wasting his time and risking sliding further into depression—but Mac persists, and is determined that this diary will not turn into a novel. However, one day, he has a chance encounter with a near neighbor, a highly successful author who once wrote a collection of enigmatic, willfully obscure stories. Mac decides that, while he will not write his own stories, he will read, revise, and improve his neighbor’s, which are mostly narrated by a ventriloquist who has lost the ability to speak in different voices. As Mac embarks on this task, he finds that the stories have a strange way of imitating life. Or is life imitating the stories? As the novel progresses, Mac becomes stranger and more adrift from reality, and both he and we become ever more immersed in literature: a literature haunted by death, but alive with the sheer pleasure of writing. 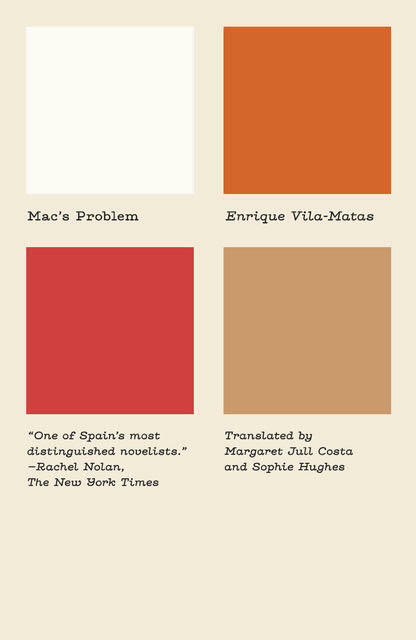 Vila-Matas’s bouncy prose is the highlight of this lively ride through a writer’s mind. Diary, essay, thriller, conspiracy theory, posthumous memoir, novel—Vila-Matas uses all the materials to construct his latest metafictional fun house.